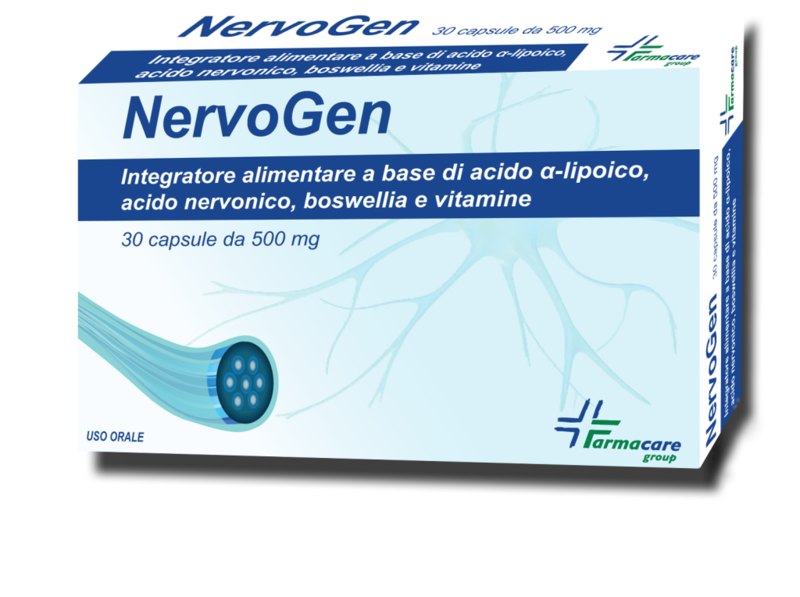 Nervogen is a food supplement based on Alpha-lipoic Acid, Nervonic Acid, Boswellia Serrata, L-Alpha-Glycerylphosphorylcholine, Vitamin E, B5, B6, B2 and B1. Its use is suggested in the case of increased requirements or decreased dietary intake of nutrients that compose it. Nervonic Acid: is a long chain monounsaturated fatty acid of omega 9 group. It ‘a fundamental constituent in the modulation of ion channels and cell receptors. L-Alpha-Glycerylphosphorylcholine (GPC): is a phospholipid which forms the chemical structure of cell membranes. Boswellia Serrata: is a plant of the Burseraceae family whose resin is able to counteract the located tension states. Vitamin E: contributes to the protection of cells from oxidative stress. Vitamin B5: also known as pantothenic acid, it contributes to normal synthesis and the normal metabolism of some neurotransmitters. Vitamin B1, B2 e B6: contributes to the normal functioning of the nervous system. It is recommended to take 1 capsule daily, to swallow with a generous sip of water.